Does it amaze you how interior design changes? Ideas come and go… I recently enjoyed The Great Interior Design Challenge, a tv series following would be designers compete against each other. The competitors were each given a room, a brief from the home owner, 3 days plus a £1,000 budget. The program always had an object for the aspiring designer to upcycle.. My daughter and I enjoyed watching it together, discussing the brave colour choices the designer made. I was left feeling my home is rather bland, safe, uninspired – or should I say practical for young kids?! Pondering the neutrality of our home, plus no budget to speak of I decided to change our dining room chairs. 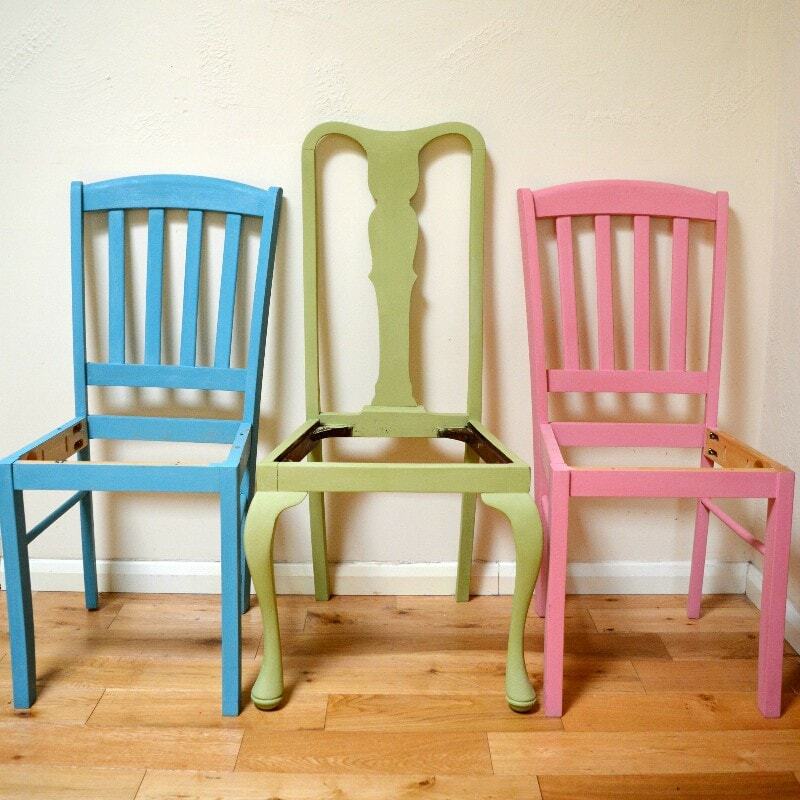 The plan to introduce some colour with restyled shabby chic dining room chairs. 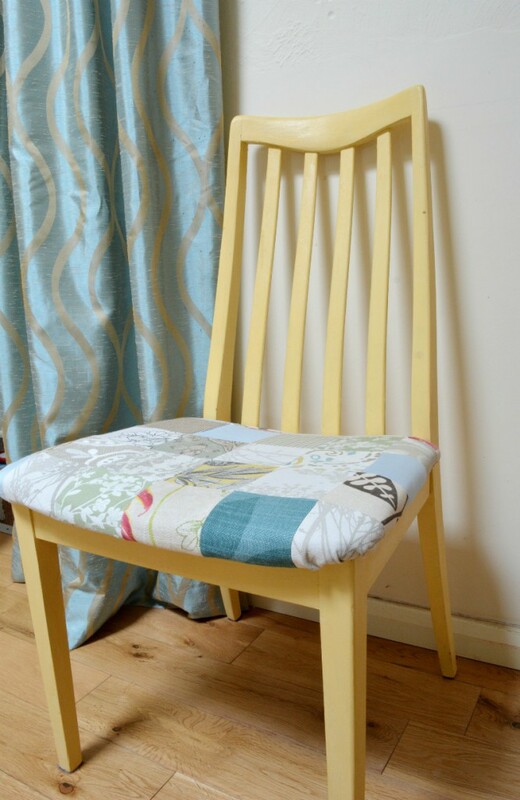 With a decision made I started to sourcing mismatched chairs, chalk paint and curtain fabric. The chairs came from the shop at the tip, two from a charity shop and one from Vintage Mischief who were holding a sale. Total cost £11. The time consuming bit, and surprisingly most expensive was recovering the seats. Borrowing a friends Big Shot Sizzix was transforming in terms of accurate cutting of 4″ square – the fabric was sourced from the Big C charity shop, cost £25. 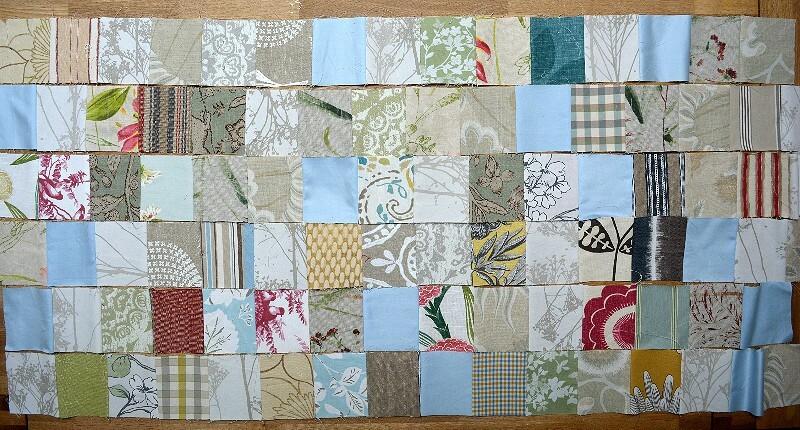 My desire for patchwork covers meant buying lots of different fabrics, this inevitably cost more than buying one former pair of curtains. The seats were recovered, using a staple gun to hold the new covers in place. I then sprayed each seat with a stain repellent (my children are not tidy eaters) before screwing back onto the chairs. Overall I am delighted with the result especially as it cost less than £50:) Sadly the chairs are not quite as sturdy as I originally thought – beware always double check the quality of your bargain before spending hours transforming it! It’s amazing what a splash of colour and upcycling can do to uplift a space. If you are looking for further dining room ideas then visit Top Reveal, they have a great selection of ideas to inspire you. "How to repair moth holes in a sweater"
They are so colourful. What a great look. Can you add anything to strengthen them? Or will you have to put teasel heads on the seats to stop people sitting on them, like they do in some stately homes? I really like your door. A fabulous shape. Love the idea of teasel heads:) Fabulous!! The chairs took far more fabric than I anticipated – but I am hoping to cover the bench seat cushions too! What a difference and look so good now you have upcycled the chairs. Wow! You’ve inspired me to give serious thought to refinishing an old cane chair that I’ve been reluctant to say goodbye to in my garage. The kids call it ‘The Poo Chair’ as it’s actually an antique commode! But very vintage and beautiful. Thankfully the bucket underneath is long gone but it still looks like a beautiful wicker chair in desperate need of new fabric. I might have to get onto it! I love your chairs – interesting to read as it’s on my ‘to do’ list for our house too. 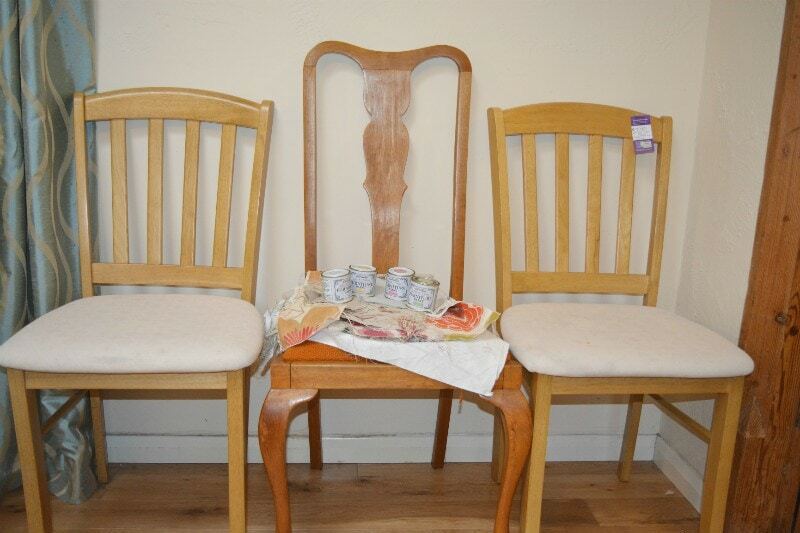 I have two charity shop antique children’s chairs too which are waiting for a makeover as well! Patchwork Fairy recently posted…Crocheted Fairy House Tea-Pot Cover! Lets not talk about “to do” lists!!!! 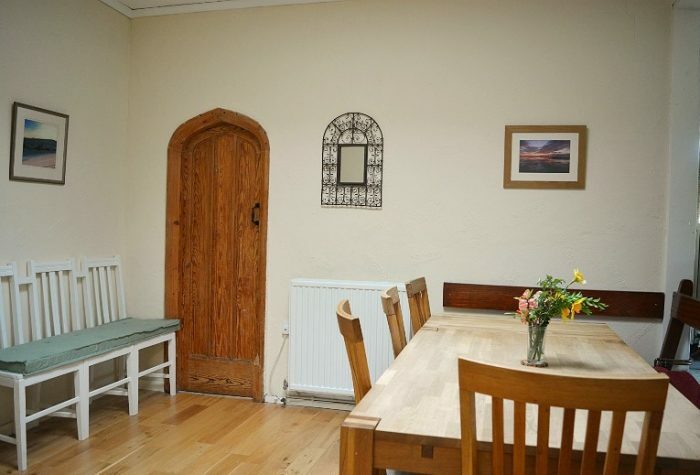 Actually, from what I could see of it, I rather liked that dining room set… It goes well with that CUTE DOOR!! BTW, *before* buying ANY thrifty chair, ALWAYS flip it to see the underside “frame” structure and TEST it for wobbles!! WELL-made OLD ones usually *do* survive the test of time! – Otherwise, your chairs are CUTE! BTW, did you have a go at that lovely Bench..? Now, THAT in a nice chalk paint would look fabulous! – And the walls could do with a bit of LARGE “art” to make the room “pop”! – [and just put that “arched” mirror over the bench to make space and to properly “reflect” the similar design of the door] — Make your own large “canvas” and let the Kids at it! 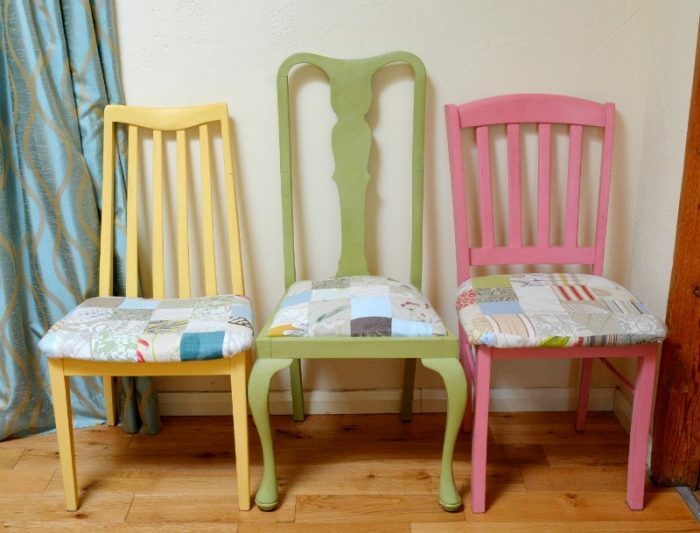 I always love your upcycling projects, they look bright and cheerful. They’re lovely! Would some metal brackets from a hardware store be enough to make them sturdier? Some of them!!!! On the search for some sturdier chairs, lol! !